Amazon India selling Bey Bee Quick Dry Baby Bed Protector (Firoza, Small, 70cmx50cm) Rs 123 (Apply 5% off coupon) which is worth for Rs 315 at lowest and best price . You can follow the below steps to buy this product at their deal price.Keep Visiting dealsheaven.in for more Best offers ,hot online deals, promo code, coupons and discount . 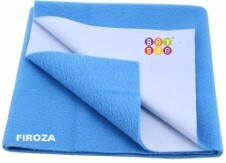 How to buy Bey Bee Quick Dry Baby Bed Protector (Firoza, Small, 70cmx50cm) ?